April 2019 The Ofcom automatic broadband compensation scheme went live in April 2019 for telecoms providers and 5 UK providers have joined the voluntary scheme: BT, Sky, TalkTalk, Virgin Media & Zen Internet. These companies will now automatically compensate customers when services do not work. News Update July 8 2017 - SKY NEWS - Utilities firm Verastar revives £500m float after Ofcom fine. Sky News has learnt that the owner of Verastar - which was previously called Unicom - has lined up investment bankers at Jefferies to take the company public. Universal Utilities T/A Unicom registered a change of name at Company House and have renamed themselves to Verastar Ltd T/A Kinex. 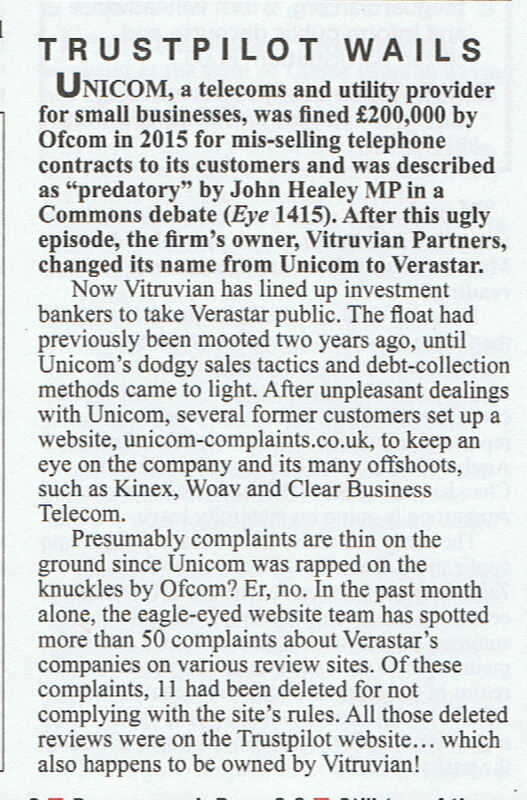 Interestingly, the VERASTAR.co.uk domain name appears to have been registered on 15 July 2015 which was just a couple of weeks before Ofcom's £200k fine of Unicom for mis-selling was announced. Ofcom have announced the provisional rulings of their Universal Utilities / Unicom investigation which was launched in March 2014. Ofcom has determined that there are reasonable grounds for believing that Universal Utilities Ltd (trading as Unicom) has contravened GC24.3 of the General Conditions between 1 March 2013 and 8 July 2014. General Condition 24.3 states that ‘Communications Provider must not (a) engage in dishonest, misleading or deceptive conduct;' Unicom will now be given time to respond before Ofcom makes a final decision.